Are you looking for educational apps? Speed! is a fast-paced card game that teaches skip-counting. Two players compete against each other to be the first to get rid of their cards, but they must watch-out...... if the number in the middle is the same they must be the first to shout Speed!, otherwise they will get all the played cards added to their stack. Skip-counting is a fundamental math skill that leads right into multiplication. Kids love to play this game because it's fun, but parents like it because it's educational. Speed! is available as physical cards, an iPad app or an iPhone app. On the iPad players begin as a Trainee and can advance through the levels to become a Legend. With five levels to pick from and eight numbers to skip-count this game will keep kids entertained for hours. They don't realize how much they are learning because they are busy trying to win. 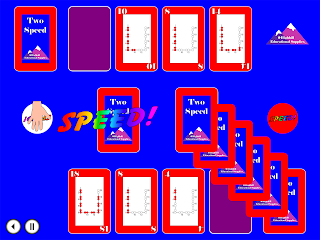 The Lite version is free and contains the Two Speed deck of cards at all levels while the Full version costs only 99 cents and contains card decks Two Speed through Nine Speed. This video explains how the card game Speed! works to help kids boost their math skills. From skip-counting to multiplication, division and fractions, this game is excellent for kids ages 4-12, or anyone learning addition through multiplication. Speed! is a fast-paced card game that helps kids learn how to multiply. What it does is teaches skip-counting which is a fundamental skill that leads right into multiplication. Continuing to build on math skills, Speed! helps kids with division, factoring, reducing fractions, and the many math skills that build upon skip-counting. I want to show you how this works. The game contains eight decks of cards, 2-9’s. Each deck is color coded and based on a different number. 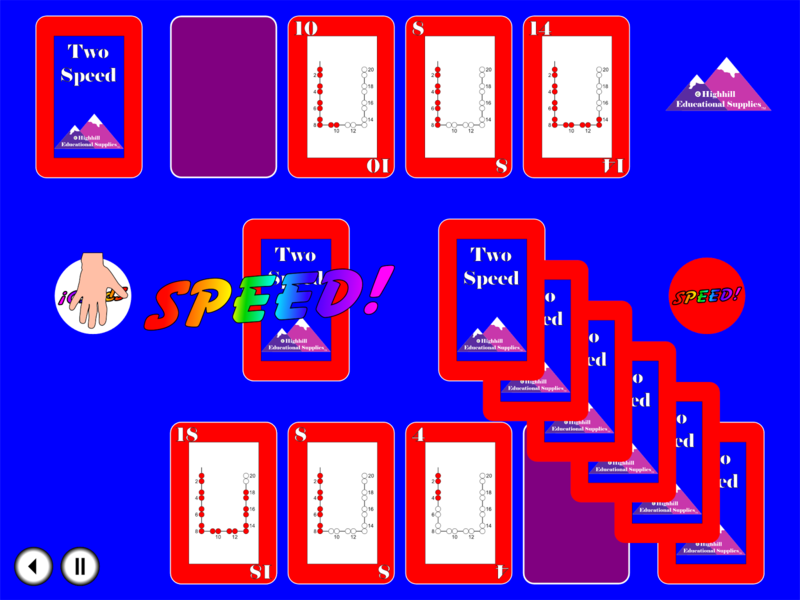 For example, the three—speed deck contains the numbers 3, 6, 9, 12, 15, all the way up to 30. So playing 3-speed, kids learn to count by 3’s. Each deck is played the same way, only the numbers change. After kids master one deck, such as 3’s, they can move onto another deck, counting by 4’s or any number 2-9. Throughout this video, I will give examples referring to the 3-speed deck, but please keep in mind that the same principles apply to all decks. There is a video showing the game being played and I highly recommend viewing it if you haven’t yet. A unique aspect of this game is that in order to win, kids not only need to know how to count higher by 3’s beginning with 3, but they need to be able to count higher by three starting with any multiple. That means they may start on 18 and count to 21, then 24. They also need to be able to count backwards by 3’s starting on any multiple of three. In other words, they may start on 15, and count to 12, then 9. Kids play to win, not to memorize, but regardless of their reason, they are learning a critical skill. After kids have played 3-Speed for a week or a month, or however long it takes them to get really fast they have memorized the answers to the 3 multiplication tables, but don’t necessarily understand the link between skip-counting and multiplication. At this point, it’s a good idea to lay the cards out in order like this, and explain this is 3x1, 3x2, 3x3, 3x4, 3x5, all the way up to 30. Then after asking the child “what’s 3x6?”, they can point and say 18. “What is 3x8?” Well it’s 24. Now the kids will begin to understand the link between skip-counting and multiplication, and it’s a good time to go back to playing the game. After all, the game is the drill work of multiplication and it’s the fun part. Kids are playing to win, and not to learn, but they are learning and that’s why it works. Some kids will understand immediately and not need any flash card work to make the transition into multiplication. Others will still need some time with flash cards, but since they are already familiar with the answers to the multiplication tables, the time spent with flash cards should be greatly reduced. Sticking with one deck and mastering the corresponding set of multiplication tables before moving on to another deck will result in a greater reduction of time spent with flash cards since there are less numbers in their head from which to select an answer. Learning division works the same way. Again, with the cards laid out in order, if the child is asked “what’s 24 divided by 3?”, they can count, 1,2,3,… it’s 8. What’s 12 divided by 3, It’s 4. It’s best to begin with the 2’s or the 5’s because they are easiest, and concentrate on one deck of cards until it is mastered. Concentrating on one deck of cards reduces the number of options for answers and helps kids to create number associations. In addition to building recognition within number families, kids that play a lot of Speed begin to recognize patterns between the decks. When playing 3-Speed, they might say, well wait a minute, a lot of these numbers are in 6-Speed!, Six-Speed has a 6, 12, 18, 24, and 30. Those numbers are in both 3 and 6 Speed…. and wow! A bunch of these numbers are in 9-speed too. Nine-Speed has a 9, 18, 27. It’s unconsciously making number associations between different decks that can really help kids to boost their math skills. Now when they get into higher level math such as reducing fractions, they might have to reduce the fraction 6/21. So then they think, wait a minute, both of those numbers were in 3-speed. There is a relationship between those numbers, and the common number is 3. The fraction 6/21 can be reduced to 1,2…..7ths. When my own kids were around the age of 7 or 8, we played Speed! every day for about 4-6 months straight. It was our math curriculum. Each day, I would lay the cards out in order and quiz them orally on multiplication for about 1 minute. Then we would play Speed! for about 15 minutes concentrating on one deck until it was mastered. This emphasis on skip-counting and number association allowed all three of my very different children to fly through many math concepts. I recommend this game for kids ages 4 through 12 or for anyone learning addition up through multiplication. As soon as kids have an attention span, a desire to play games, and can count they are ready. The 2’s and 5’s are easiest, so they are the best decks to start with. When kids are learning addition, they are ready to begin counting by 2’s. We used this game as our primary method for teaching multiplication. Other families have used Speed! on family game night, to improve or review multiplication, to gain a good number sense, or as a fun way to work on math over the summer. Since there are 8 decks of cards in the set, 16 kids can play at one time making the game a great option for co-ops and schools. Remember, kids play because it’s fun and they want to win. Not because they want to boost their math skills, not to learn multiplication, but they do. So have fun with it. Thanks for watching. Last summer, the kids got lots of exercise, had some fun, worked a little and got to sew. We are a homeschooling family that looks forward to a relaxing summer off from school. Over the summer our priorities switched from schoolwork to exercise, reading, yard work, sewing and free time. Although exercise is something we do year round, we tend to spend even more time exercising during the summer months. The kids like to run races, we take family bike rides and we live in a beach town where there are lots of opportunities for swimming. We take full advantage of those opportunities. In addition to exercise we tried to create a balance of other activities. Before the summer began, my nine year old was a very resistant reader. She could read, but didn't like it. Therefore, I wanted to emphasize reading in a positive way that would hopefully result in a willing reader. Just under a year ago we moved into a new house with a lot of yard and yard work. Since there were many things I wanted to improve the yard work was the perfect opportunity for the kids to help out and earn some extra money. Each day I planned to work outdoors, but that was a lot for children. Therefore, I made yard work an option. Our new house is very close to my parents house and my mom has a love of sewing. The girls and I, being quite crafty ourselves, wanted to learn from grandma. Thankfully she was willing to sew with us one morning a week. With these goals in mind we put together a daily routine. This schedule was followed quite loosely which is why we called it a flow. Obviously rain changed many plans, as did orthodontist appointments, play dates and special events. Overall, it was successful as it helped us to make time for reading, sewing and yard work which would have been easily skipped without the plan. Because the reading was spread throughout the day, we almost always fit in one reading session and usually completed two or three each day. At the end of the summer I was surprised at how many books were read. Sometime during the summer, my reluctant reader found the Magic Tree House series. From that time on, I found her reading at times not on the flow. I can't express how excited I am about this change. The yard still has a long way to go, but the kids pockets are full of money. They didn't help every day, but helped enough to make an impact. Once school started, they continued to help with yard work many times throughout the fall. Sewing with grandma was a hit. I loved it! We continued to sew one morning per week throughout the school year, completed numerous projects, and learned a vast array of sewing techniques including applique, piping, putting in zippers, basic crazy quilting, and so much more. My son made a model of a suspension bridge. Throughout history humans have built three main types of bridges: beam, arch and suspension. The book Bridges: Amazing Structures to Design Build and Test explains each type in detail including how the loads are carried, steps in design, installation issues to consider, well-known examples of each type and suggestions for hands-on activities. After reading the section on suspension bridges, we watched the video Bridges of New York. With the East River and Hudson River surrounding the island of Manhattan, New York City is full of bridges. This video details unique aspects of many of the New York bridges as well as the people who designed and built them. After learning about suspension bridges, my son built a model. First he secured to main lines raised on chair back supports to two books serving as anchors. Then he placed a cardboard road deck on top of the books with a heavier book on top of each end to hold it in place. Next he added thread lines connecting them from the deck to the main support cables. Voila! What a cool project. I highly recommend this book The book Bridges: Amazing Structures to Design Build and Test.